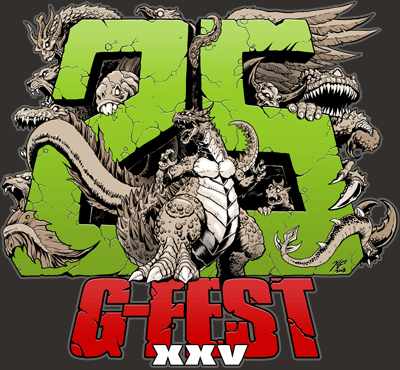 Another G-Fest has come and gone. I (Nate) am still recovering from the post-convention blues. Reality has been slowly sinking back in as I go back to my jobs. One would think I’d be used to this by now, what with all the conventions I attend, but it’s never easy. Regardless, the consensus is this was the biggest and best G-Fest yet. For a convention its size, there’s lots to do. If you were one of our patrons on Patreon, you got exclusive up-to-the-minute access during the weekend. If you’d like to have that and other exclusive content, please consider supporting us on Patreon! Brian and I upped the ante this year, signing up to be part of five panels between us—including our own! In case you didn’t know, it was titled, “Godzilla and the Japanese National Spirit.” At least several of the attendees were listeners, who we met beforehand and after the presentation. It really humbled us upon learning how many fans we got to be able to meet. Our presentation went well, and our audience asked some great (and fun) questions. One attendee was a university professor from New York, who was impressed with us. A special thank you to everyone who attended! For those who couldn’t make it, we’ll be sharing the audio and video July 25. I (Brian) was a member of the “GINO” Panel, which discussed Godzilla 1998 on its 20th anniversary. It was my first panel ever, and I shared some of the wisdom from the episode on the movie. My main points included how the ad campaign was better than the movie, that it should have ended at 90 minutes, how no one could say those lines and sound good, and how there are many far better movies out there if you just want a good popcorn movie. Half of the audience said they hated the movie, so I felt like I represented them well. Saturday was a busy day for me (Nate). I was on three panels, with two of them in a row! The first was “Godzilla Stories,” an annual panel where people share their fanfictions and/or how Godzilla has impacted their lives. There were several touching stories—including one from a mother who lives in Fort Wayne!—and I got to encourage some young writers with their fanfictions. The second was the similar “Art of Kaiju Writing.” You may remember this as the panel I got myself on at the last minute last year. This was a writing advice panel, and I was one of four “pros” answering questions. This was immediately followed by the “Pacific Rim 2” panel. I was one of four people who discussed the film. By “discuss,” I mean, “utterly destroy.” Nobody on it liked it much, and I was quite outspoken about it. We were all saddened when the great Akira Takarada, the “Godfather of G-Fest,” was unable to visit us. However, J.D. Lees and the organizers were able to book not one but two great replacements: Don Frye and Kenpachiro Satsuma. Brian and I made sure to meet them as well as Megumi Odaka and G-Fest staple Robert Scott Field. I’m happy to say my Blu-ray of Godzilla vs. King Ghidorah has been signed by three of its stars. 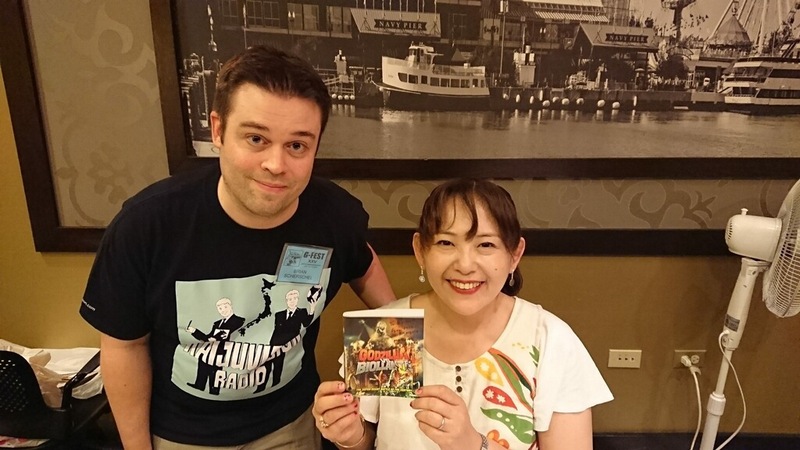 I (Brian) was really happy to meet Megumi Odaka for the first time. Incidentally, Godzilla vs. Biollante was selected in another panel to be the “Greatest Godzilla Movie of All Time”, which seemed fitting, as this was her first of the six movies she appeared in. 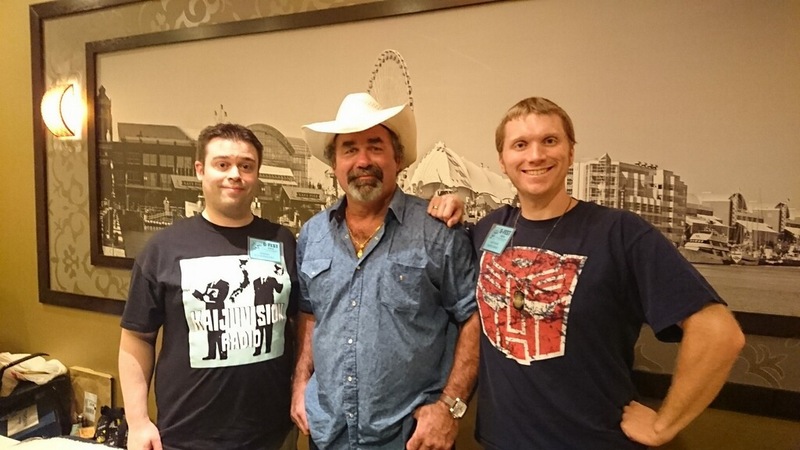 It was fun meeting Don Frye and his panel was overwhelmingly entertaining and fun. For the first time, we interviewed guests for the podcast at this year’s G-Fest. The first was John LeMay, author of 18 books, including The Big Book of Japanese Giant Monster Movies: The Lost Films and his newest book, Terror of the Lost Tokusatsu Films. Our second interview was Danny DiManna (aka Danzilla93), a listener and, more importantly, the creator of the Godzilla Novelization Project. His goal is to write a novelization of all 30+ Japanese Godzilla films. Both of these interviews will be posted sometime in August. I’m glad I went to last year’s G-Fest because it helped me understand the convention’s unique personality. That made it easier to “break in,” so to speak, this year. It also helped that Brian and I stayed in the Crown Plaza Hotel, where the convention was held, which also allowed us to experience another part of G-Fest: the in-house TV station. Starting Thursday and running until Monday morning, the hotel’s informational channel broadcast various tokusatsu films, TV series, and documentaries. Brian and I were able to watch things like Super Inframan, Yokai Monsters, and Agon: Atomic Dragon. It was fun. As the G-Fest program put it, turn off sports and news for a few days. 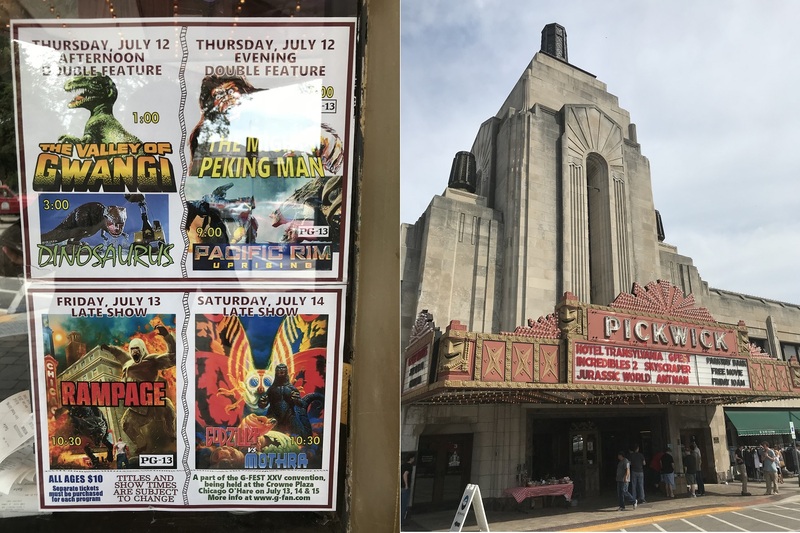 I also attended many of the film screenings at the Pickwick Theatre. The first double-feature on Thursday was The Valley of Gwangi and Dinsosaurus! I’d not seen either one, so it was a treat to see them on the big screen. Gwangi is a legitimately good film while Dinosaurus! 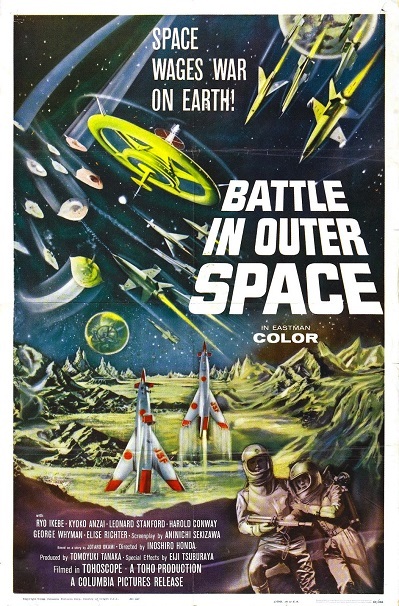 is asking to be on Mystery Science Theatre 3000 (it kinda has been already). I haven’t laughed at or riffed a film so much at the theatre in my life as I did at the latter. What made it better was my fellow theatre-goers were also riffing it, adding to the fun. Friday night I went with Danny and his friends to see Rampage, which I hadn’t seen yet. It wasn’t great, but it was better than it had any right to be. 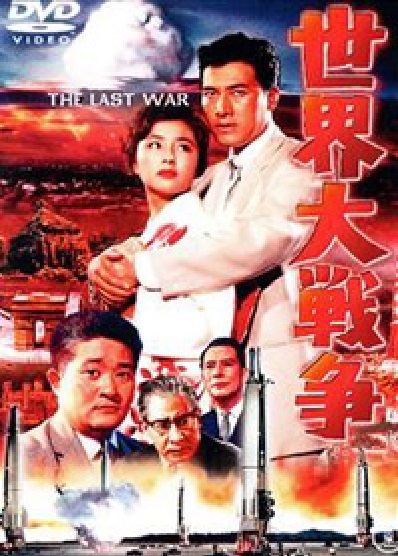 Saturday I was joined by them again to see the main event: a screening of Godzilla and Mothra: The Battle for Earth, which was introduced by Satsuma. 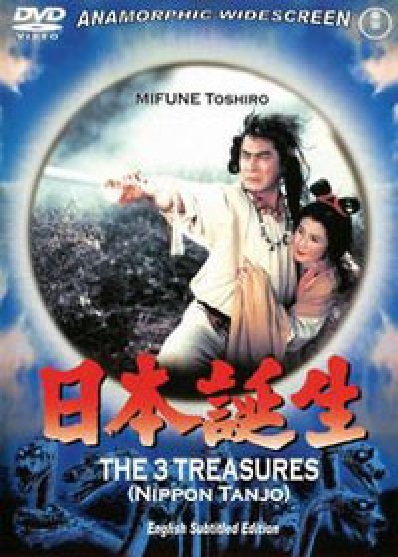 While I’ve seen this film many times, I went primarily for the experience. Did it help the Heisei film seeing on the big screen? Not really. It actually made the flaws more obvious. However, I saw it with a crowd of fans, which made the screening exciting. One of the things that makes G-Fest special is it feels like a family. It’s a small and active con that is slowly growing. Everyone knows everyone and is welcoming to newcomers. Now that we’ve gotten more involved with the show, Brian and I feel even more like a part of that family. We love it. Here’s to another 25 G-Fests…and beyond!